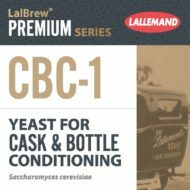 LalBrew® CBC-1 has been specifically selected from the Lallemand Yeast Culture Collection for its refermentation properties and is recommended for Cask and Bottle Conditioning. LalBrew® CBC-1 referments beer efficiently due to its high resistance to alcohol and pressure. The flavor is neutral, therefore the original character of the beer is preserved. The yeast will settle and form a tight mat at the end of refermentation. LalBrew® CBC-1 can also be used for primary fermentation of Champagne-like beers, Fruit beers and Cider. LalBrew® CBC-1 is a killer yeast, meaning it will secrete a toxic protein that can inhibit killer sensitive strains (most brewing strains are killer sensitive). While this is a positive yeast trait when conducting a pure fermentation/refermentation with CBC-1, extra care should be taken to ensure proper cleaning procedures are in place to avoid any cross contamination with other brews. Best used for refermentation purpose conducted preferably with priming sugars such as dextrose. Refermentation can be completed in 2 weeks at the recommended temperatures. The optimal temperature range for CBC-1 yeast when refermenting is 15°C(59°F) to 25°C(77°F). CBC-1 contains an adequate reservoir of carbohydrates and unsaturated fatty acids, and cell division (typically one division) is likely to occur in the bottle. Temperature and inoculation rate can be adapted in order to achieve desired results. If the beer is partially carbonated, the sugar addition can be reduced.